Helen Frost has written a novel in verse. This type of writing is becoming one of my favorites for many reasons. It is written in small vignettes. We get a glimpse into the lives of students in Room 214. These students could be any student in any classroom across the world. We see their thoughts, frustrations, concerns, joy and so much morel We even hear from the teacher. Because these are all made up it made it even more interesting. I sat there reading and plugged in my own students. The book gives us an emotional look into the lives of students. As teachers we often don’t know the baggage children carry to school with them. It is often that courageous friend who lets us in on the secrets so that we can in some way understand or help out. The other reason I like this author’s books is because she explains in the back some of the forms she used for the poems. This helps me as a writer try out different forms. I was first introduced to this author and her magical poetry in her book Hidden, (you can find my review here). In this book she has once again done something spectacular in my eyes. One part of the book the poems are written in an acrostic form. When you go back and read the words down the side you get a deeper meaning for the poem. 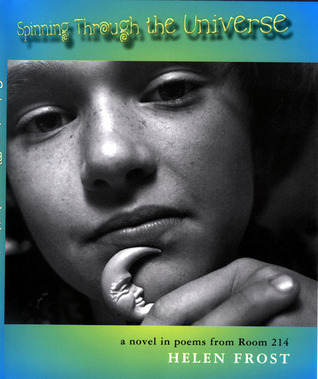 I have several students who have read this book because they have to read a book of poetry for my class. I wonder how many read the back and how many found the magic?